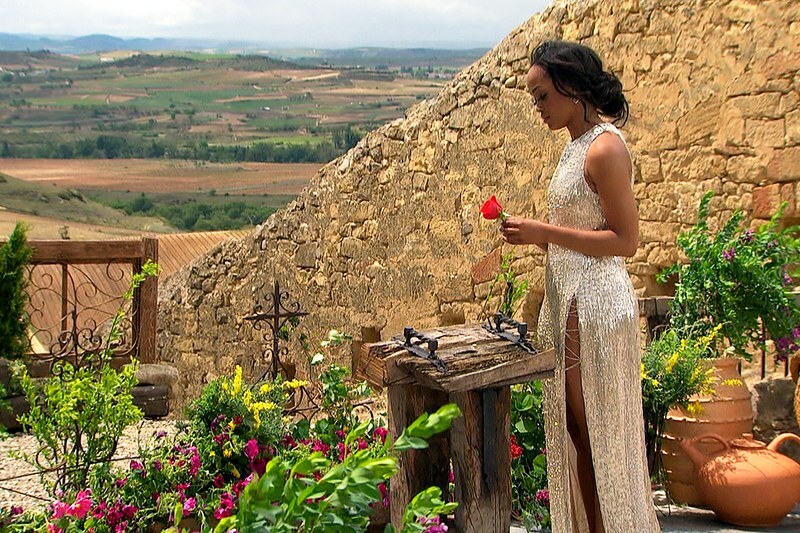 Well, readers, we reached the end of the line: the finale for The Bachelorette happened this week and boy, was it a doozy. Follow along with Chels and Rebecca as they recap exactly what went down and who Rachel's final rose went to. Rachel accepted Bryan’s proposal after a long and hectic finale. What did you think of the moment? Rebecca: I know I’m in the minority for liking Bryan, but I thought the proposal was very sweet. It’s clear they’ve been very into each other the entire season, so I don’t think anyone was surprised he was her final pick. Chelsea: I’m with Rebecca in the minority of Bryan fans. He’s been consistent all season with his feelings and hasn’t played games with her. And she’s been super obvious with him being her favorite. He was sweet re-proposing during the live show and I’m glad she’s happy. I’ve said all season that I trust Rachel’s decision. Peter has been struggling the past few episodes to get into the same place as Rachel. Were you surprised to see them break up before a proposal? Do you think he’s ready to be the Bachelor? Rebecca: I was not surprised that Peter didn’t propose. He’s made it very clear he had no intention of proposing, and props to him for staying true to himself and not allowing himself to feel pressured into doing something he wasn’t ready to do. Perhaps, in another setting, he and Rachel could have worked, but he couldn’t/wouldn’t give her what she wanted, so she made the decision to choose someone who could/would. Whether or not that decision was influenced by the franchise and viewer’s pressure for an engagement, we’ll never know, but we have to trust that Rachel made the right decision. Side note though — this finale’s formatting was whack. Not a fan. I like the two-hour episode and then the live After the Final Rose afterward. Chelsea: By that point, I wasn’t surprised that he didn’t propose, but I feel like he knew what show he signed up for and had a really good long game. His high school yearbook photo with the quote of him saying he wants to be the Bachelor in the future makes me think he had a really good long game and maybe wasn’t as genuine as he seemed. The whole break-up and After the Final Rose was so uncomfortable to watch. If those are his real values, then I do not think he will ever be ready to be the Bachelor. I would still watch his season but if he’s really looking for love, then this franchise is not for him. I second Rebecca’s note about the finale format. It was just an unwatchable mess. Eric got closure with Rachel after being eliminated early. How would you like him to return to the franchise? Rebecca: The way Eric handled the break-up was, in my opinion, more mature and respectful than any other break-up in the history of the franchise. I’ve really come to love Eric, and I would love to see him return to the show as the next Bachelor. As much as I love Peter, I agree with Rachel that the process isn’t right for him, and we shouldn’t blame him for that. I already know the process wouldn’t be right for me, as I’m the same as Peter: I would need looooooots of time to consider getting engaged/married to someone, and 6 or 8 weeks or however the long the show runs for is definitely not enough time. But for others it is, and Eric is one of those people, so I think he’d make a great Bachelor. Plus we’d get to see more of his family, and we all know how wonderful they are. Chelsea: Eric handled his break-up with Rachel so well and has really had a few great episodes the last few weeks. I still don’t think he’s mature enough to be the next Bachelor but I’m glad he had a clean and friendly goodbye. I don’t think I can forgive him for wearing that white t-shirt and tennis shoes to the last rose ceremony. That kills any chance of me wanting him to be the next Bachelor. He is one of the few that would thrive on Paradise though. Any stray thoughts from the season? Rebecca: I just want to reiterate that Rachel is hands-down the BEST Bachelorette the franchise has ever had. She handled her season with so much class, elegance, and confidence. She stayed out of the drama, didn’t string any of the men along by keeping them longer than they needed to, and stayed true to herself through the entire process. I have so much respect for her and wish so much happiness for her. Chelsea: Rachel was an amazing Bachelorette but had the WORST selection of guys. Kaitlyn is right up there with her but she had so many great men to choose from, it just wasn’t fair. I’m just so impressed with how Rachel handled all the drama and still managed to have fun. The show format for a lot of this was a mess and I do think it took away from the quality of her season. She kept her word all summer and I just loved and respected her more and more each week. Wishing her and Bryan all the happiness. I actually only desire to state this Rachel is definitely hands-down the perfect Bachelor a franchise includes ever endured. The woman completed the girl's year or so by using a great deal of training, splendor, plus self-belief. The woman kept away from the performance, didn’t cord many of the gentlemen down by way of always keeping these folks more as compared with people were required to, plus kept real so that you can micro through the entire approach.